Family Advocacy Clinic Partners with Center for Families to Run Pop Up Clinic at Lincoln Square Legal Services, Inc.
You are at:Home»Law School News»Family Advocacy Clinic Partners with Center for Families to Run Pop Up Clinic at Lincoln Square Legal Services, Inc.
Attorney Andrew Weisfeld, Christina Eadie, and clinic interns Deborah Levine and Sloane Lewis collaborated with the Albert Einstein Medicial College to run a one-day, pop-up clinic at LSLS, Inc. on the 9th floor. 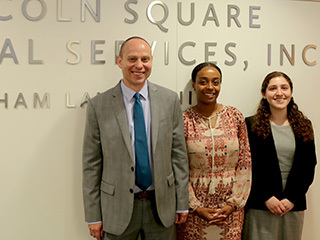 LSLS, Inc., the law firm arm of the Fordham Law Clinic, performed intakes and gave brief advice in person after reviewing client family documents. The client families signed up for legal consultations at C.E.R.C. (Children’s Evaluation and Rehabilitative Center) which provides testing and evaluation of children with special education needs. The Family Advocacy Clinic, under the supervision of Associate Dean Leah Hill, sponsored this event.